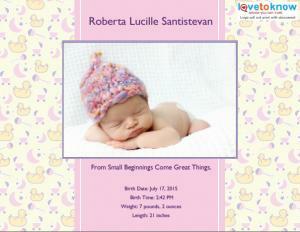 Share the excitement of your baby's arrival with a custom photo birth announcement. To save time, you may want to prepare your mailing list during the last few weeks of your pregnancy. If you're the crafty type, making your own photo birth announcement is an inexpensive way to introduce your new bundle of joy. Your local craft store should carry a selection of vellum, card stock, patterned paper, rubber stamps, stickers, and ribbons that can be used to craft a creative announcement for your son or daughter. 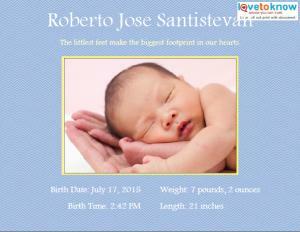 If you would like to use a template to create your photo announcement, use one of the four options offered by LoveToKnow. Each announcement is editable and printable; print these using a high-quality paper stock. If you need help downloading these printable announcements, check out these helpful tips. 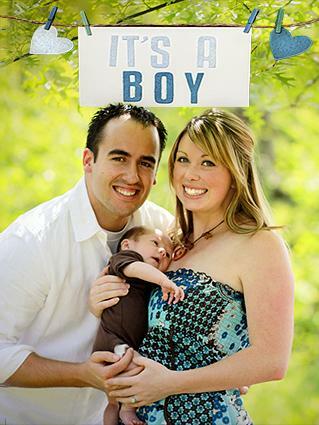 Download a cute blue photo announcement. Download a cute pink photo announcement. Download an adorable blue announcement. Download an adorable white announcement. If you're short on time, or you're not the crafty type, there are many companies that will allow you to quickly order a simple photo birth announcement. It is surprisingly easy to click through the ordering process and ship quickly for immediately gratifying results, leaving you more time with baby. 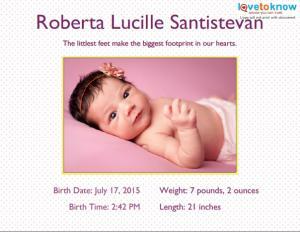 Shutterfly.com offers a broad selection of templates that can be personalized with your baby's photo and birth information. Customizing your design can be as simple or as elaborate as you like, and the step by step prompts make the process very user friendly. The Printable Baby has a colorful array of photo announcement designs that are certain to touch the hearts of all who receive your charming, custom, print-at-home baby announcement templates. A variety of colors, sizes, and borders are available to choose from, so the end result is truly a creation all your own. Reflect Your Personality - Make it fun and unique by thinking outside the box. How about a baby boy and Daddy fist bump, or your darling baby girl wrapped in a hot pink boa with an enormous baby grin? Use your imagination and your personal style to declare the arrival of your newest addition. Consider Image Quality - Four megapixels is the acceptable minimum resolution requirement for image quality. Keep in mind that image pixelation may be affected if you're cropping and zooming portions of a larger snapshot. If taking the photo yourself, consider lighting - avoid very dark locations or extremely bright spots. Assess Orientation - For best results, the orientation of your photo should match the orientation of your birth announcement. A photo with a landscape orientation may not fit well into a card with a portrait orientation, and vice versa. When taking photos, shoot from both perspectives. If you'd like to give friends and family a lasting souvenir to commemorate your son or daughter's birth, consider ordering magnets that feature your baby's photo birth announcement. These clever magnets, just the right size for putting on the refrigerator, are both practical and attractive. 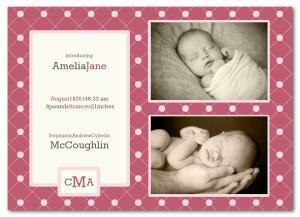 They can be sent on their own or used in addition to a more traditional birth announcement. If you have a serious sweet tooth, you can choose to celebrate your son or daughter's birth with customized photo birth announcement candy bars. These delicious Hershey's chocolate bars feature a photo of your newborn, plus his/her name, birth date, weight, and family information. While they can be challenging to send through the mail, they're great to give to coworkers, neighbors, or close friends. 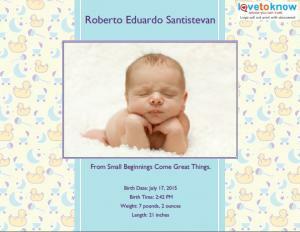 You can even order custom photo stamps to further personalize your birth announcement. These unique stamps are valid U.S. postage that's guaranteed to make your announcements stand out from the crowd. The birth of a baby is an event that should be joyously celebrated. Give people what they want - the opportunity to get a look at your new bundle of joy!